For those who would like to develop their skills in this Japanese art and learn a more intricate, but not difficult design, the Chrysanthemum is worked using an eight 'complex division' measurement. These traditionally geometric patterns will inspire you to create your own colour combinations and designs. They make lovely ornaments or gifts, and are great to hang on a Christmas tree or in the window. 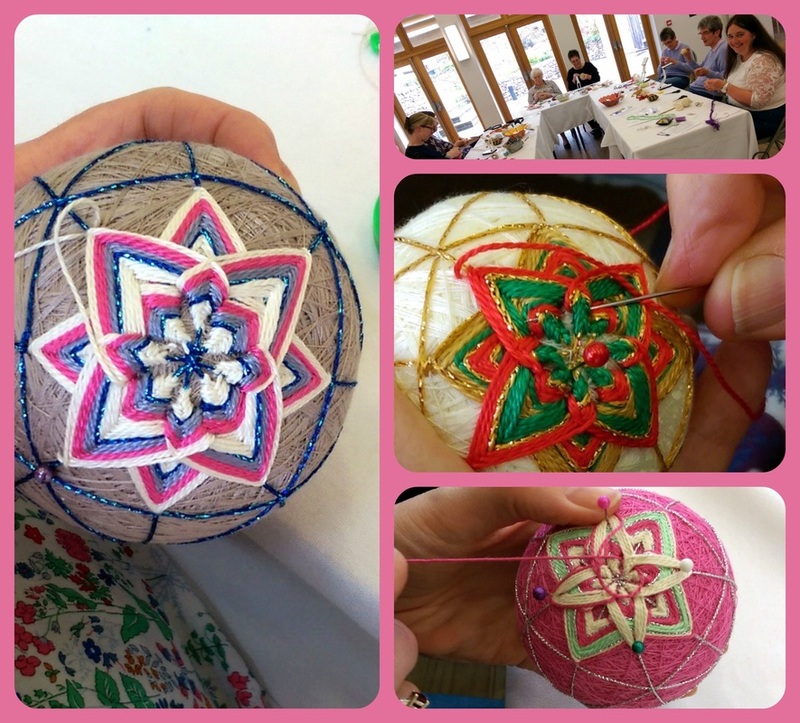 Suitable for students who have at least attended the workshop 'Making a Temari Ball' and ideally a Level 2 Temari workshop, or have made several temari balls previously. One pre-wrapped polystyrene ball* (so that we can start measuring at the start of the workshop). * Please use a 60 mm polystyrene ball. The ball should be wrapped to the cotton stage and be ready for measuring at the start of the workshop. Please make sure the ball is wrapped with a good layer of wool before wrapping with the cotton, so that it is not too small. All other materials and equipment will be provided. N.B. You will be provided with a poly ball as part of your pack, to replace the one you have wrapped. You should bring one pre-wrapped ball with you, ready for measuring (see above)*. You will learn to measure out eight 'complex divisions' and work the Chrysanthemum design, which is replicated 6 times over the ball. There will be a range of coloured threads to choose from.